In its long and distinguished history, there have been few years as important to Rocky Mountain PBS as the one we just concluded. This was the year we turned the corner and began to build a national public media model for this new millennium. We changed many things last year, including the way we do business and the way we create. With our always-lean and dedicated staff, we managed to produce more local programming, garner more Emmy® nominations (15!) and Emmy® wins (6! ), grow our membership base and collaborate with more partners than ever before. 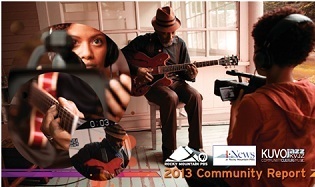 We also completed an exciting merger with I-News, the state’s most trusted public-service journalism team, and KUVO, a jazz, blues and news public radio station dedicated to providing distinctive music, news and informational programs. With these mergers and exciting new partnerships, we’ve grown to be so much more than a television station. We have become a dynamic transmedia hub that provides compelling content and enriching experiences to families across our state on every type of media platform. At a time when most media outlets are contracting, Rocky Mountain PBS is expanding services, developing partnerships and growing membership. We are proud of the partnerships we’ve developed over the years, and we’re excited about improving public media for all Coloradans. entertained, they prefer to be educated. Rocky Mountain PBS assures both of those will continue into the future. These steps are the foundation upon which further innovation will be built in this new fiscal year. About the only thing that hasn’t changed is our reliance on your support. As a nonprofit, this relationship is at the core of our existence. So we urge you to pay close attention to all the exciting things happening at Rocky Mountain PBS, and to support us throughout the months ahead – with both your time and your dollars. We are proud of what, together with you and thanks to your support, we are all creating behind our purple awning.